The city of Budapest is both the largest and the capital of Hungary. 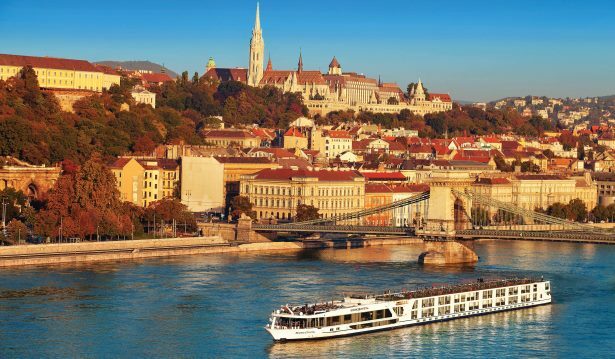 It’s a busy port for river cruises from Budapest which allow passengers to frequent some of the most fascinating stops along the way. Before leaving Budapest, travellers are encouraged to explore this historic city and its many sights such as Liberty Square, the Hungarian Parliament, Buda Castle and so much more. Tuck into one of the many traditional soups, Székely Goulash (which is a kind of Goulash stew made with sauerkraut and various meats), Töltött paprika (peppers stuffed with meat, rice and various spices) and, for the sweet tooth, Dobos Cake or one of the other many delicious desserts traditionally associated with Hungary. Your river cruise takes you along the famous Danube River all the way from Budapest to Amsterdam with several stops along the way. The Danube is the second-longest river in Europe and runs through ten countries, namely Germany, Austria, Slovakia, Hungary, Croatia, Serbia, Bulgaria, Romania, Moldova and Ukraine. Some of the stops along the way include famous cities such as Vienna, Durnstein and Regensburg. Each of which offering passengers the opportunity to set foot on dry land and explore the many sights and attractions. While docked along the shore, passengers are encouraged to venture further inland to such locations as Bratislava, Slovakia’s capital, the village of Melk located close to Durnstein and other options to visit the Czech Republic or Salzburg, Austria. Regensberg is yet another popular stop that allows travellers to enjoy many cultural and historic sites including the oldest sausage kitchen in the world! Now this really is the place to enjoy some of the finest sausages in the country! From Nuremberg to Bamberg and on to Wurzburg, there’s plenty to enjoy as far as views from the ship are concerned. Of course, travellers eagerly welcome every opportunity to dock so that they may enjoy some of the local delicacies such as Smoked Beer. If you’re not much of a beer drinker, no need to worry! There are some lovely wines that are made in this region and wine tasting tours are a great way of getting familiar with a variety of them before making any purchases. The Rhine Gorge offers a very different type of scenery to travellers as well as the opportunity to visit the Marksburg Castle. This medieval castle was used as a prison in the 19th century and, today, it is under the protection of the royal families and is one of the main attractions within the UNESCO World Heritage Rhine Gorge. Let’s not forget about the busy cities of Dusseldorf and Amsterdam! The Dutch are known for many things including windmills, tulips and wooden shoes. There’s no shortage of history here and the architecture is certainly something to be admired. Once travellers reach their final destination in Amsterdam, they are encouraged to spend at least a couple of days here to get the most out of their holiday. These river cruises are made possible by Scenic River Cruises and they usually last for approximately two weeks. Set aside three weeks if you hope to spend extra time in your departure and destination ports. The cruise line offers similar itineraries on several of their ships and the rates will depend on the date of travel as well as the cruise ship itself.